Dinosaur Comics - May 2nd, 2013 - awesome fun times! 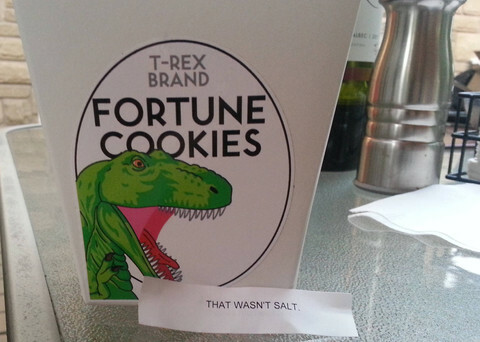 May 2nd, 2013: Did you know there are Dinosaur Comics fortune cookies? There ARE! And you should get some because these bad boys are of an edition that is LIMITED. So limited that they GO AWAY FOREVER on Friday! and more! Basically say goodbye to all those sucky fortunes that have been holding your life back and say hello to Dinosaur Comics fortune cookies because they are BETTER. One year ago today: yesterday many people emailed me to tell me that "lasers" stood for "Light Amplification by Stimulated Emission of Radiation" and so the word "lazer" didn't make sense, but it's like they've never even heard of "Light Amplification by Zeta-wave Emission Recovery"